VANCOUVER — The Humane Society for Southwest Washington is entering into a “season of fundraising” from March until May 5th, according to Denise Barr, vice president of marketing for the Humane Society. Two fundraising events highlight the Humane Society’s spring fundraising efforts. On Sat., Mar. 24 the Humane Society, in partnership with the Columbia Edgewater Country Club, will host a wine tasting event called Cheers!. On Sat., May 5, the annual Walk/Run for the Animals will occur at Esther Short Park in Vancouver. This will be the second annual Cheers! event hosted by the Humane Society, according to Barr. At the event, hosted at the Columbia Edgewater Country Club in Portland, approximately 200 different varieties of wine will be on hand for guests to sample. Guests can choose to buy varieties of wine at the event, and a portion of the proceeds from the sale of the wine will be used to support the Humane Society for Southwest Washington. The second fundraising event being held later in the spring by the Humane Society is the 27th annual Walk/Run for the Animals. The event is a 3 mile walk or 5 kilometer run in which people can participate with their animals. The Walk/Run is designed to encourage participants to form teams and raise funds as a team to support the Humane Society. Special prizes are available to those who raise the most funds. The event will also have other activities in addition to the walking or running portion. There will be a vendor section set up, and a beer garden sponsored by Heathen Brewing Feral Public House. Portland radio station 98.7 The Bull will have its morning crew at the event, and famous animal face Rojo the Llama will make an appearance, according to Victoria Wagner, events coordinator for the Humane Society for Southwest Washington. Additionally, the Vancouver Police Department’s K9 unit will attend and give demonstrations. Barr said that one of the draws for the Walk/Run is that it is pet friendly, and participants are encouraged to bring their dogs with them. Many of the animals present are “alumni animals,” Barr explained, meaning that they were once cared for by the Humane Society for Southwest Washington. “They love the fact that they can come and participate with their own animals,” Barr explained. 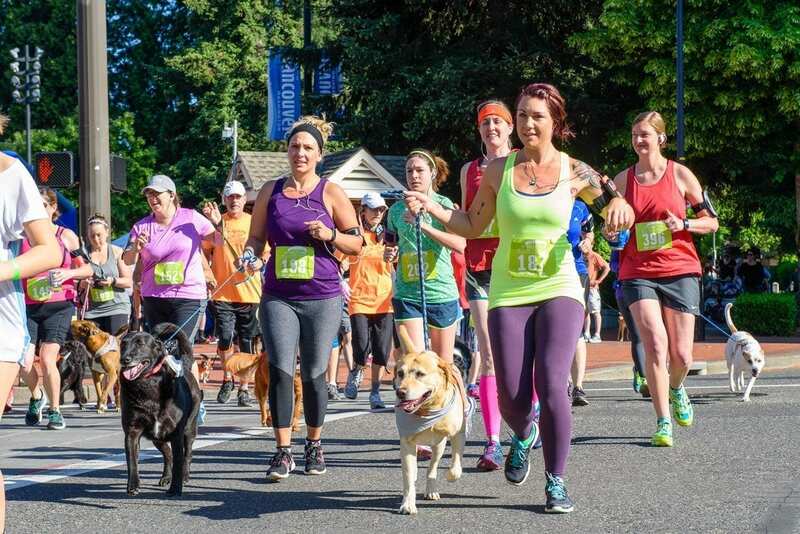 The Walk/Run event is a major component in raising funds for the Humane Society, and the organization relies on people forming teams to maximize the amount of money raised before the event. Last year, a team made up of Humane Society staff, volunteers and board members raised approximately $18,000, Barr said. The Cheers! event will take place at the Columbia Edgewater Country Club located at 2220 NE Marine Drive, Portland, OR, 97211 on Sat., Mar. 24 from 4 to 8 p.m. It will be a drop in event, with guests able to come and go as they please. Tickets are $45 and available through Mar. 19. Guests must be 21 or older. The Walk/Run for the Animals will take place at Esther Short Park on Sat., May 5 beginning at 7:30 a.m. Registration for walkers is $40 through Mar. 16, $45 from Mar. 17 to Apr. 30, $50 from May 1 to May 4 and $55 on the day of the event. Registration for runners is $45 through Mar. 16, $50 from Mar. 17 to Apr. 30, $55 from May 1 to May 4 and $60 on the day of the event. More information about the events can be found on the events page of the Humane Society for Southwest Washington webpage at https://southwesthumane.org/engage/events/.